ROME -- The London Daily Mail has published an article about a painting in Campion Hall at Oxford that they think is a lost Michelangelo. Don’t get your hopes up. It seems that the expert, Antonio Forcellino, an Italian restorer, has a habit of running around the world finding what he claims are lost Michelangelos. Last year he was in Buffalo, New York. The newspaper headline from The New York Post October, 10, 2010, reads “ A ‘Mike’ Found in Buffalo”. The first line is “This unfinished painting of Jesus and Mary could be a lost Michelangelo, potentially the art find of the century.” That’s one “find of a century” two years in a row for the restorer. And he has written a book about the discoveries. Could this be the beginning of a new global industry? The painting in Buffalo is uglier than the one at Oxford. Michelangelo Expert Professor William Wallace was called in on this proposed discovery too, and remained tactfully non committal in each case, and may have been quoted out of context. Both of Forcellino’s claims are backed up by what he claims is valid technology. The Daily Mail article this month regarding the painting at Oxford says that the painting on the left is by Michelangelo, therefore the one on the right, the one at Oxford, is also by the master. The one on the left is not by Michelangelo so the theory is wrong from its premise. This must be a mistake just in the article because art historians are in agreement about the authenticity of only three Michelangelo oil paintings. Michelangelo did not repeat and he never copied himself. Both paintings derive from a Michelangelo drawing now in the British Museum. 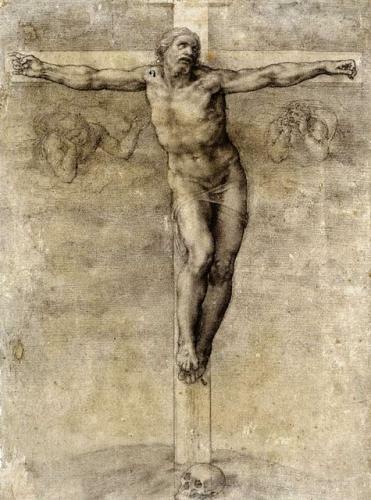 Originally the drawing was a gift from Michelangelo to his friend Vittoria Calonna. Aside from provenance we always know about the correct attribution of his drawings because drawings are autographic like hand writing. Indeed, the painted and engraved versions were not by the master’s hand. They were made by pupils and friends. He gave them the drawings to copy. The most notable students were Daniele da Volterra, and Sebastiano del Piombo, and the friend- biographers were Giorgio Vasari and Ascanio Condivi. And a known contemporary copier was Marcello Venusti. The painting in the dormitory for a long time had been ascribed to Venusti. Antonio Forcellino has said that infra-red technology has revealed that Michelangelo painted it. What does this mean? At best it could mean that what the infra-red revealed was something resembling the drawing of Michelangelo, the under drawing, because this is what infra-red shows. However no technology in vogue today can shed any light on the deficiencies of the finished painting. Did Michelangelo do the under drawing on Venusti’s canvas. Not likely, why would he? The great, very finished drawing was available to be copied, and it was copied by others. The Daily article author was wise enough to consult Michelangelo expert Professor William Wallace. He said three things. He said it is interesting because Forcellino thinks it is genuine and he continues, “ We are never going to be totally sure if it is genuine as Michelangelo’s contemporaries would paint designs that he drew…”. He goes on to say that the painting reveals something about the tastes of the time. Let me decode what Wallace said. Firstly, he is being respectful to a colleague. Then he reiterates what I have said above about the common occurrence of contemporaries making copies. The part about revealing the tastes of the times I think refers to the similarity in bright colors of this painting to the brilliant colors of the recently cleaned frescoes of Michelangelo in the Sistine Chapel. That is a superficial resemblance revealing something about the use of bright colors at that time, but these colors are garish. The late Harvard Professor, John Shearman, wrote a lengthy essay about the Sistine subtleties of color, some reflecting the fashionable sixteenth century shot silk variations in color. 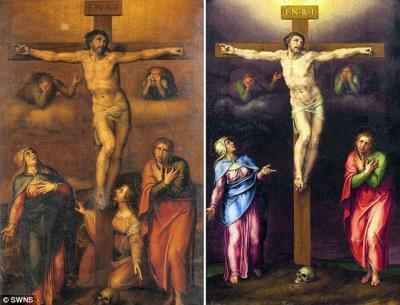 The painting in question is just not good enough to be by the master’s hand. The drawings of the Virgin’s hands are weak. The torso of the figure of Christ does not turn in space as it does in the British Museum drawing. Michelangelo did three oil paintings. There are two unfinished paintings that show the artist’s drawing under the more finished oil. They are both in the National Museum in London. The third is the Doni Tondo in the Ufizzi in Florence. It is the only oil that he finished. Not surprisingly for him, he pushed the medium of oil beyond the bounds of where it had previously stopped. I have been fortunate to correspond with Professor Wallace, only to tell him how much I admire his video series on Michelangelo. I did have conversations about Michelangelo over a number of years with John Shearman when he was at Harvard. And I spoke to renowned Michelangelo expert and text book author Frederick Hartt not long before he died. At that time, his fellow art historians had spoken out forcefully criticizing the fact that he, as an expert in the field, had authenticated a small clay model as being Michelangelo’s model for the marble giant, the David. The problem was that he was a part owner of the terracotta. It was a conflict of interest compromising the impartial judgment of an expert. He was sad about the censure from his peers. I do not have an opinion about whether the model was made by Michelangelo or was made after the fact of the carving by someone else. I agreed with Hart that whoever made the model was an exceptional sculptor. But there were many exceptional sculptors in Florence for many decades. I mention this to point out that it must be very uplifting for an art historian to believe that he has made a discovery. But let’s keep a clear eye in looking at Michelangelo’s great work and legacy because the standard is so high and we should not muddy the waters with wishful thinking. Be suspicious of any claims for authenticity based on technology if the art does not look right.